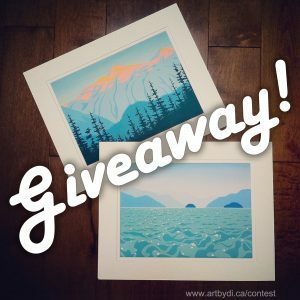 Sign up to my E-Newsletter and be entered to win a FREE 8″ x 11″ Fine Art Print! Simply use the Subscribe form on this page to be entered into the prize draw. Subscribers will receive awesome monthly updates on new paintings, prints, special offers and upcoming events. Contest closes at midnight PST on Sat Dec 9th 2017. Following I will choose a winner at random to receive a free 8″x11″ print of your choice. Please be sure to enter your name & email correctly, the winner will be contacted via email. Contest open to residents of Canada and the US only. One entry per person. LIKE & SHARE the contest post on my Facebook Page to receive an extra entry into the draw!